From basic to feature-rich tamper proof phones; Kyocera cuts across the whole spectrum. Kyocera smartphones plus no-contract wireless plans for data, calling and texting. Reviews, Promotions, and Deals on Cell Phones from Verizon, FreedomPop, Net 10, Simple Mobile, Sprint, Straight Talk, Tello, TracFone, Q Link, Total Wireless, Twigby. Imagine that split-second impulse when your phone accidentally slips from your hand! Within that moment, your heart seems to stop while your mind is racing trying to think of the worst-case scenario! That was just a recap; meet the Kyocera Hydro Icon, a phone that will ensure your heart continues to beat at normal rates even when it slips from your hand. The Kyocera Hydro Icon is a 4.5-inch smartphone, designed for the military, literally speaking. Whether you are going on a camping trip or playing by the pool, this phone will be there with you all the way. This hard-bodied phone is designed to absorb shocks and tampering, so the unexpected doesn't have to wreck your day. The phone is not only great on the body; it is equally rich in features. Interestingly, with all the amazing features, the phone comes at an irresistible price from FreedomPop. FreedomPop is a company that offers free cellular services on first sign up, more on this later. Let's have a look at what comes in the package. 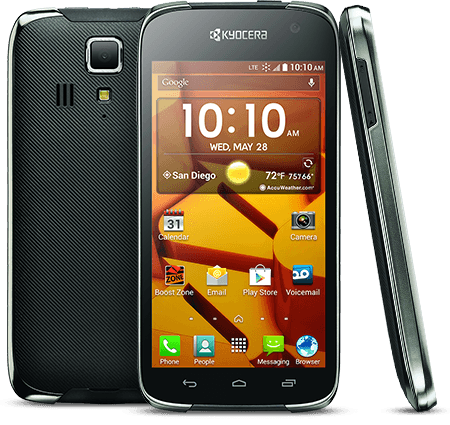 The Kyocera Hydro Icon is a prepaid smartphone available on the FreedomPop website. The purchase box includes the phone, battery, wall adapter charger, a standard USB cable, service guide, warranty and a quick setup guide. Even though the phone has a low-price tag, the exterior design wasn't compromised at all. It has a beautiful architecture that looks and feels really premium. On the front, it has a 4.5-inch impact resistant display. Since it's an Android Jelly Bean phone, it lacks the floating navigation buttons seen in later Android version. Rather, it has physical navigation buttons at the lower part of the display; the back button sitting on the left, the home button in the middle and the recent apps button on the right. To maintain the water resistivity status, the phone doesn't have an earpiece. It rather has a smart sonic receiver located on the upper part of the display, together with the LED indicator, proximity/ambient light sensor, and the front camera lens. Moving on to the layout around the edges; the phone has the power button as well as the headphone jack on the upper edge. The lower edge hosts the micro USB/charging port as well as the primary microphone. The right edge has no button whatsoever, while the left edge hosts the volume rockers. The back panel has a matte plastic finish. It feels flat in the palm with no texturization. It's also removable to give access to the battery compartment as well as the slots for the SIM and microSD card. The back camera with its flash sits on the upper part of the display. That sums up our tour around the device, so we’ll head straight to the camera. For picture and video capture, the Kyocera Hydro Icon is fitted with an 8-megapixel rear camera with a LED flash and a 2-megapixel front camera. When compared to other phones in the same price range, I found the ‘Hydro Icon to perform incredibly. For low light settings, the LED flash on the back camera comes in handy ensuring that you capture all your moments. Although the front camera is only 2MP and lacks a LED flash, it's still way better if you consider most devices in this bracket have a 0.3MP camera. Nevertheless, it performs great in good lighting ensuring that all your video calls go as you would want. Video capture is rated at 1080p, which is amazing on a budget smartphone. However, I noticed the phone becoming a bit slow when recording at 1080p, so I toned it down to 720p, and my video capturing experience went fine. For photographers and super users, the camera fortunately offers some manual controls such as changing the ISO or exposure settings. Modes such as panorama, HDR, color effect, and continuous shooting are available. Continuous shooting lets you capture up to 30 photos in a burst when you touch and hold the capture button. Smile shutter is also a cool feature that comes with the camera. With the feature turned on, the camera automatically takes a picture when it detects a smile. This feature comes in handy when you want to take underwater shots. Remember, the phone is water resistant. However, the screen doesn't respond to touch when under water. So, you only need to launch the camera app, submerge yourself and smile to capture pictures! 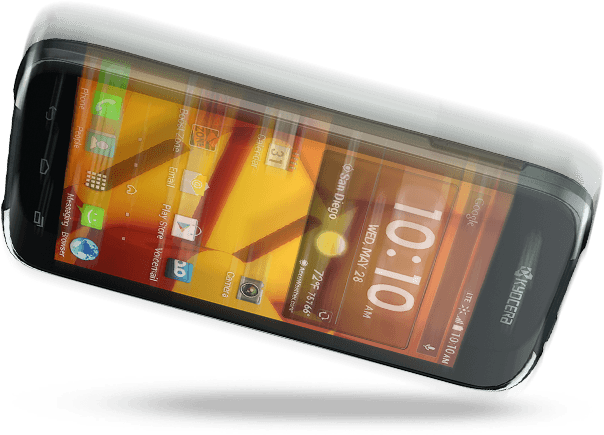 The display on the Kyocera Hydro Icon is a 4.5-inch IPS impact-resistant Quad High Definition screen. It has a screen resolution of 960x540 pixels, which may not be the best out there, but it's actually a very decent display. What I loved most about the screen are the great viewing angles, thanks to the IPS technology. No matter how you hold the phone, characters still appear clearly on the display. Indoor visibility is fantastic since the display shows items brightly. In direct sunlight, the glare becomes a bit problematic, but that's the giveaway for a budget smartphone. There's no oversaturation of colors, and the screen is also very responsive. Generally, I found no issues with the display. 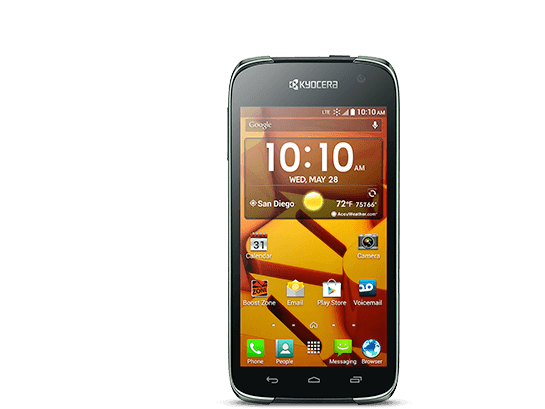 The Kyocera Hydro Icon is fitted with a 2000mAh battery with a standby time of 8 days and a talk time of up to 14 hours. This being a compact device, with only 4.5-inch of display, the battery capacity is sufficient to keep the phone running throughout your work day. The phone comes with battery life extension features ensuring you remain juiced up until you get to a charging outlet. EcoMode is an app that comes installed on the Hydro Icon. It lets you tweak settings like vibrations, haptic feedback, or screen brightness when your battery drains below a certain level. Another app for battery maximization is MaxiMZR which lets you prevent certain apps from using the background data when your phone is in sleep mode. The battery is removable, so if you plan to stay out longer, you may consider carrying a spare battery for swapping when the primary battery runs. Since the tamper proof design of the phone makes it a great companion for camping, (and camping may last up to several days), carrying a spare battery is the best option here. Interestingly, the Kyocera Hydro Icon has a PMA-enabled wireless charging feature. You only need to place it on a compatible charge pad, and the phone will start charging. The wireless charging pad is sold separately though. Onboard the Kyocera Hydro Icon is an internal storage capacity of 8GB. With about 4GB available for your use. For a low-end smartphone, this is still a nice deal, although it may not be appealing to users who prefer lots of storage space. The good thing is that the phone has a microSD card slot that supports memory expansion with an external memory card of up to 32GB. The Kyocera Hydro Icon is proficiently packed with features to ensure yo achieve all your daily tasks. To start off, it comes running Android 4.3 Jelly Bean. While this is an older version, it supports thousands of apps on Google Play Store. The phone is fitted with a Qualcomm Snapdragon quad-core processor clocked at 1.2GHz and 1.5GB of RAM. These resources ensure better multitasking, faster processing, and smooth navigation through apps and user interfaces. 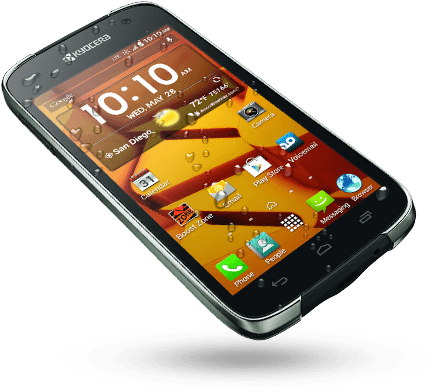 To remain water resistant, the Kyocera Icon Hydro is fitted with Smart Sonic Receiver instead of a traditional speaker. Sound quality is great and I didn't miss out on words during phone calls. With 4G LTE capabilities, the Hydro Icon lets you experience faster browsing, video, and music streaming with minimum buffering when you are in a region with good network coverage. To enjoy prolonged internet services, you will need to purchase a premium FreedomPop service plan which is still affordably priced. The phone is also very responsive to touch. I didn't notice any stuttering when flipping through menus, and apps launched at a reasonably good speed. The phone performs averagely in the gaming sector. The Hydro Icon includes an array of sensors for surrounding awareness; an ambient light sensor to detect the amount of light in the surrounding and adjust the screen brightness accordingly. GPS for location services and live Google Maps navigation. Accelerometer for controlling characters on the phone by tilting your device. It has Wi-Fi and Bluetooth. If affordability and water resistivity is your thing, the Kyocera Hydro Icon will amaze you. 8MP back camera. 2MP front camera. Battery capacity: 2000mAh removable. Talk time up to 14 hours. Standby up to 8 days. Internal Storage: 8GB. Supports memory expansion with a microSD card of up to 32GB.